Are you looking for something different to put on your cheeseburger? 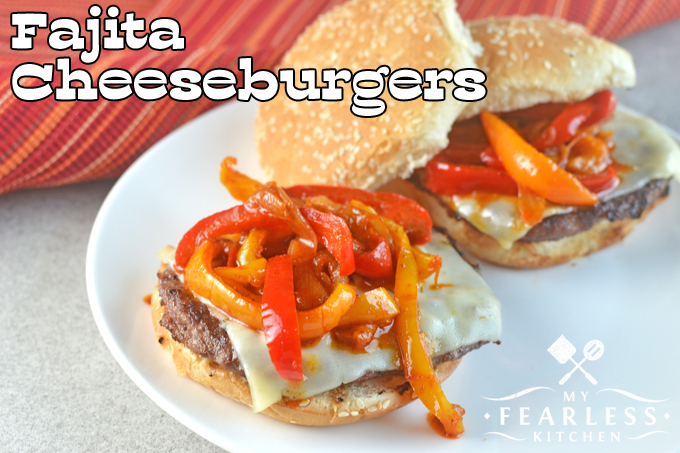 Try this Fajita Cheeseburger recipe for your next burger night. Pile on the veggies and skip the salad! Cheeseburgers are such a great summertime food… They are easy to cook, you can make them outside on the grill (my favorite way to cook them! ), or you can make them inside on the stove if you can’t get outside. But how many times can you eat a burger with a slice of cheese and maybe some ketchup? 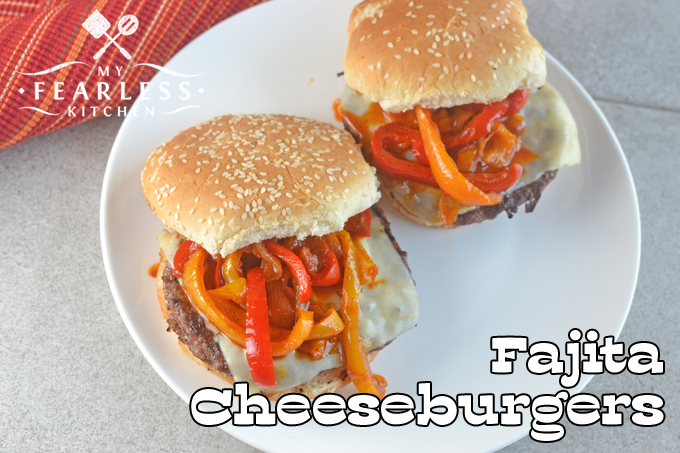 Dress up your next burger night with these Fajita Cheeseburgers! John and I were trying to figure out what to have for dinner one night, and this idea popped into my head. I love fajitas, but I don’t really like to put my food together at the table. Especially if you’re at a restaurant – I’m paying for someone else to make my dinner! I do really love the flavor of the peppers and onions, so I thought I would try it on a burger! I used one packet of taco seasoning with 2 sliced bell peppers and 1 sliced onion (check out this post for tips on how to get even slices from your onion). The seasoning flavor was a bit strong, so if you want a more mellow flavor, add more vegetables or don’t use a full packet of the seasoning. I really wanted to use fajita seasoning, but I couldn’t find any at my grocery store. (Stock your pantry with fajita seasoning here.) If you can get your hands on a packet of fajita seasoning, you can use that instead of the taco seasoning. It will be delicious either way, I promise! 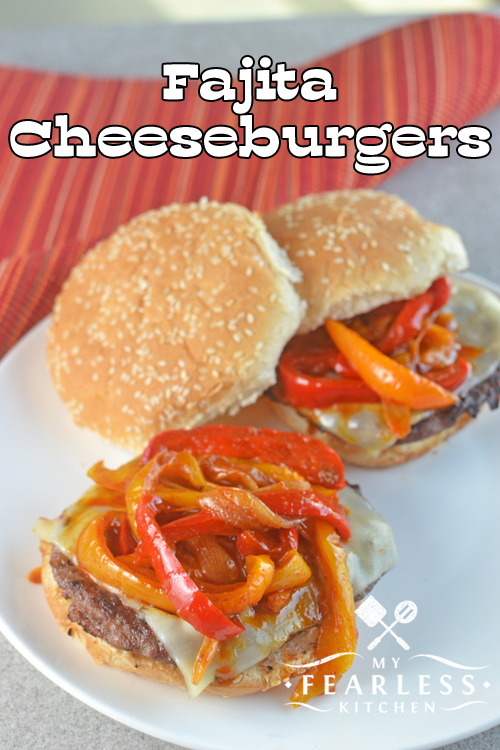 Cook the burgers while the peppers and onions are cooking on the stove, top the burger off with a slice of pepper jack cheese and as much of the pepper mixture as you want! It will get pretty messy, so be prepared with a stack of napkins! This is not the type of burger that you can eat in the car or on the go. What are your favorite toppings on a cheeseburger? Preheat oil over medium heat in a large skillet. Add sliced peppers and onions to the hot oil. Cook, tossing frequently (tongs work great for this), until the peppers and onions begin to soften. Add taco seasoning packet to pepper mixture and toss well to coat. Do not add water. Cook for an additional 2-4 minutes, until the vegetables reach desired level of softness. Meanwhile, cook the burgers on a grill on high heat or in a skillet on the stove over high heat. Burgers should cook for approximately 3-6 minutes per side until the internal temperature measures 160 degrees Fahrenheit with a meat thermometer. Toast hamburger buns, if desired. Place one cooked hamburger on each bottom bun. Top with 1 slice of pepper jack cheese and a generous portion of the pepper mixture. Finish with the top half of the bun.